Terry Fator’s birthday wish came true on Monday night. The entertainer welcomed the 51 contestants from the Miss USA Pageant to his show, “Terry Fator: The Voice of Entertainment,” at the Mirage. After the opening number, Fator was surprised by his wife, Taylor Makakoa, and the reigning Miss USA Nana Meriwether when they presented him with a beautiful cake creation, courtesy of the Mirage. He was also presented was a massive birthday card signed by audience members and fans. The festive night ended with each audience member receiving a cupcake from Freed’s Bakery. The Miss USA contestants are in Las Vegas this week preparing to win the coveted crown. Miss USA will be broadcast live from PH Live at Planet Hollywood Resort on Sunday, June 16. 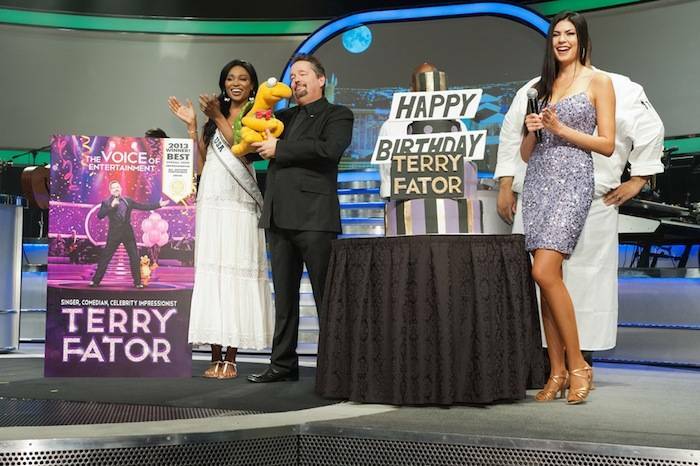 Miss USA 2012, Nana Meriwether and Taylor Makakoa present a birthday cake onstage to Terry Fator during the Terry Fator: The Voice of Entertainment show at the Mirage, Las Vegas in Las Vegas, Nevada on Monday June 10, 2013. She will spend the next week touring, filming, rehearsing, and making new friends while preparing to compete for the coveted Miss USA Diamond Nexus Crown. Tune in to the crowning moment LIVE on NBC starting at 9:00 PM ET on June 16th, 2013 from PH Live. HO/Miss Universe Organization L.P., LLLP. Miss USA 2012 Nana Meriwether and Taylor Makakoa present a birthday cake onstage to Terry Fator.